Verdict: The LogIT range has used 'microsense' sensors from day one. It's the only system where you can take a temperature sensor you bought a dozen years back, and global warming or no, bet that it’s still measuring Celsius as good as ever. Equally the latest acceleration sensor works with the original LogIT data logger. The product continuity and compatibility is exceptional and it commends the range. So long as temperature remains temperature in this world, these sensors will be a good investment. *** LogIT Davision CX / Davision BX are upmarket loggers, offering fast logging for physics and a display that shows graphs live. It's a good all rounder but the need to do serious physics will swing the decision to buy. At its launch we said "The LogIT Datavision (£359) is a logger with the distinction of letting you plug in those old probes to get measuring. What’s new is a data logger that displays readings on a colour screen so you can distinguish lines on a graph. Unusually the unit lets you do a surprising amount of analysis without going near a PC. Nevertheless there is a USB link so that you can connect to one easily. The Datavision measures rapidly, meeting the benchmarks that physics teachers set and yet still featuring the ‘press-the-green-button’ easiness that biology fieldwork needs. As a progression from the black ‘LogITs’ to ‘Datameter 1000’, and for over £100 more, Datavision is sensing gone sensible." Comment: the penalty for high performance is battery life but this is similar to its competition. Verdict: LogIT Lab versions 2 and 3 ably do the basics of measuring and displaying results on a graph. It's great (and rare) that the software 'goes looking' for an interface when it is launched. This way you know without annoying messages that you're well connected and ready to measure. It is remarkable that not many other brands do this and in consequence, LogITlab is one of the few reliable pieces of data logging software. LogITlab is thin on features needed after age 15, so if you want to analyse the data you collect you'd best use 'Datalogging Insight' (Logotron) at this stage. Both Datalogging Insight and LogIT Lab software import and export SID data files. LogIT Voyager is the latest interface of this range and is simple yet refined. Its battery life is so good, this is one of the few interfaces you can take from the cupboard and find working. For everyday use in the lab, with students up to age 15, Voyager can be recommended as the most evolved logger in this range. Voyager has a shape that suits measuring outside. 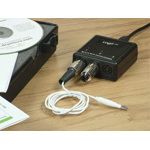 Comment: LogIT Voyager is the most convienient data logger I've used. It will do the extras that a biologist wants to do and meet the needs of the rest of the department also. What you need to decide is whether the reliability of Voyager is more empowering than the extra features offered by competitors including Data Vision (below). Data logging technology needs to be astoundingly simple to find an easy place in a practical lesson. When there's pouring and heating going on, the LogIT Black box datalogger is a remarkable piece of technology that fits in painlessly. There are no buttons to press, no drivers to install and no power brick to connect, just a USB cable and up to three sensors and then you are working. It's happy with existing LogIT sensors that I've had since the dawn of the National Curriculum. I have had a good play and would report more in time but frankly there is little to say: it lets you measure with ease and can handle the trickier classroom tasks to do with magnetic induction or the flicker frequency of a fluorescent lamp. The LogIT Black Box comes with a booklet of useful, clever and low hassle activities to try like showing the insulating property of carbon dioxide gas. 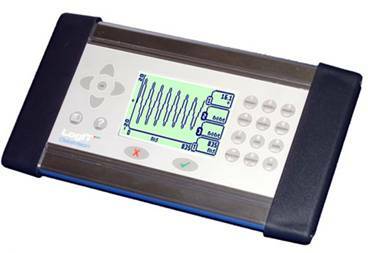 LogIT Explorer is the primary data logger in this range. Primary schools can consider 'LogIT Explorer' as a tidy device with three built-in sensors that does as much as needed at low cost. It is based on established equipment costing a couple of hundred GBP more. A compact data logging unit, LogIT Explorer has a screen to show temperature, light and sound readings around the school. It can also store room temperatures, noise and sunlight levels over many days also. Explorer connects to the PC (via a serial or USB lead) and there are as many sensors as a primary school should need. These sensors use a different connector to other LogIT sensors and they have been chosen to suit use in primary schools – i.e. they’re cheaper than usual. A long battery life suits Explorer to occasional use. A BETT Award winner. The Explorer Controller (£50) allows you to power a buzzer, a fan or lamp in response to changes in temperature. This is very functional – however a primary school might go for something more chunky. Comment: The 'LogIT Explorer is a logger to highly recommend to primary schools. Out of its box you could be measuring in minutes – while its great battery life helps it to survive a stay in the cupboard. It's been a favourite for ease of use and battery life. It really is not for secondary use as the bigger range of secondary sensors don't work with it. Xperiment is ideal for activities involving one sensor. It offers a fast and reliable way to plug a pH, oxygen or voltage probe into the computer and start measuring. Twice a BETT Award finalist. Verdict: LogIT eXperiment offers a fast and reliable way to plug a pH, oxygen or voltage probe into the computer and start measuring. Works reliably with LogIT Lab software and Insight software. A USB lead lets you use the older LogIT systems on the latest laptops. Superb backwards compatibility with sensors and accessories. We would recommend Pro-temp temperature sensors (and extension leads) to secondary schools. Most sensors are compact. £100 buys a pair of light gates, light level sensor, and quality temperature probes. Works with PC, Mac, Pocket PC. Cables and software used to let you use this with Apple Emate, Windows CE, Psion. Datameter 1000 has a rechargeable battery and two-line display screen. A ready to go kit comes with LogIT lab software, temperature and light sensors. Sensors for pH, volts, pulse distance and all the rest are available. Verdict: The LogIT Datameter 1000 is a good system – it can take readings away from the computer and offers as much capability as the school curriculum actually needs. Clever engineering make LogIT Datameter 1000 one of the most reliable systems. Reasonably priced, Datameter 1000 is the basis for a whole class. Today (2006) I'd focus on the more recent offerings of Datavision and Voyager (above). Datavision CX and Voyager replace the original black LogIT SL box. A unit called ‘LIVE’ is an economy version. A LIVE kit with temperature and light sensor costs £100 which makes for a considerable saving. This only works when connected to the computer so it is meant for bench use rather than to take readings away from the computer. Adding a sound sensor and another temperature sensor would give you a good starter kit for age 11-18. A CheckIT display unit (£80) can be added to a LogIT or LIVE unit to see the readings from the sensors when they are not connected to the computer. However if you are buying all from new, I’d get the better box to start with. Any of the above units connect to either serial or USB ports simply by changing the cable. A Datameter USB Starter Pack (£310) does data logging on computers without a serial port. The bundled LogIT lab software is for starters, while Data logging Insight software (Logotron) offers a rich assortment of display and analysis tools.